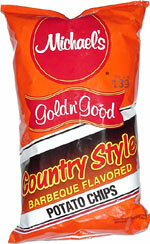 Taste test: These are average barbecue chips. Nothing wrong with them, and the taste is OK, but nothing special either. They've got a very slightly hot aftertaste. Unfortunately, the bag was only about 1/3 full (even with very few broken chips).